Young people who attend a specially-tailored service at Action Mental Health in Enniskillen have been gifted a brand new space, kitted out with a host of modern new features. 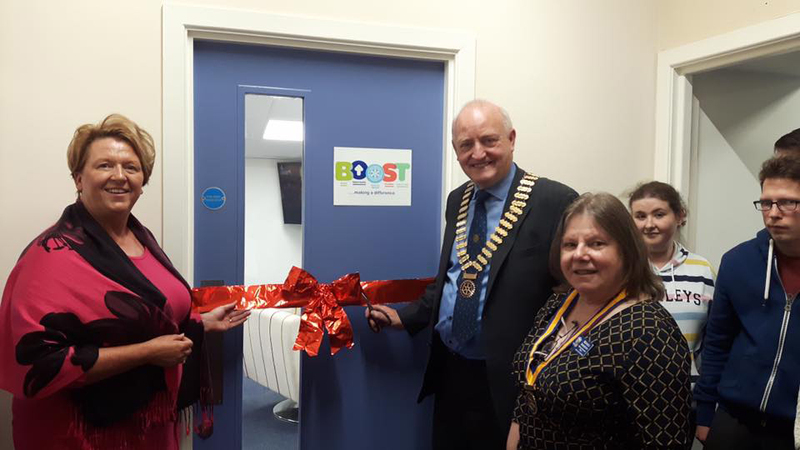 The brand new BOOST room at AMH New Horizons Fermanagh has been unveiled, offering 18-25-year-olds experiencing mental health issues a dedicated space, complete with kitchen and hang-out room featuring gaming and high-tech equipment. BOOST is a programme designed to help young people re-build their confidence and self-esteem, and to re-engage in education following periods of mental ill-health. BOOST also includes a range of personal development, vocational and employability initiatives, along with a range of fun and life-enhancing activities. BOOST’s new facilities will assist in the delivery of cookery and domestic programmes designed to encourage independence among young people, while the high-tech additions, including drones, will take photography classes to new heights. The creation of the cool new space has been entirely driven by donations from the Enniskillen Rotary Club which hosted a number of activities over the year, including a coffee morning and popular Christmas Concert held across two churches, St Macartin’s Cathedral and St Micheal’s church. The Rotary also topped up the pot at AMH’s Great Big Purple Picnic fundraising event last month. BOOST has also been chosen as the beneficiary of the recent Fisher Cycle Challenge. Among the number of individual donors who supported the project were Billy and Margaret Mulligan who asked guests at their recent wedding to donate cash to local charities, in place of gifts – including AMH. As a result, the couple handed over a cheque for £2700 to the BOOST service, after hearing of the work of Action Mental Health during the Enniskillen Rotary Club ball. Rotary President Henry Robinson also made a similar gesture, asking former work colleagues to donate cash to AMH instead of contributing to a retirement gift for him. AMH New Horizons is part-funded through the Northern Ireland European Social Fund Programme 2014-2020 and the Department for the Economy.